In 960 you must have the repeat, or you're leaving out the best bit of the first movement, and I vaguely remember Uchida leaves it out. Why do pianists do that - you're a musician aren't you? Maybe you have an answer better than "to fit it on one side." I'm guessing it could be a time constraint but that's unlikely. I'm usually a fan of Schubert repeats so I understand what you mean here. A good example being Schubert 9 where my go-to versions are Muti and Minkowski for repeats, yet occasionally I pull out my Bohm. It's probably my favorite version albeit without the repeats. It seems to be a more recent thing with Schubert to include the repeats as many of the war era conductors did not. I can let you guys have it, FLAC or mp3. Please PM me if interested. She makes Schubert sound like Beethoven -- you know, moving forward in a determined way towards a goal. It seems to be a more recent thing with Schubert to include the repeats as many of the war era conductors did not. I think Richter was the first to record the 960 repeat in 1957. In 960 if you don't take the repeat you lose the ominous bass trill. It's not just a repetition of music previously heard. I wonder if people don't take the repeat because the trill doesn't fit their picture of Schubert. You know, "placid Schubert." It appears I'll be doing some reevaluating on this, as I may be suffering from "first version favoritism" thanks to Mr. Brendel. Brendel was my first upgrade in Schubert's sonatas and certainly my most played to date. Not only does he not take the repeats, but he's lobbied against them. Uchida does play the repeats, at least in the set I own, and I see exactly what you mean now. It's a relatively new set for me and I'll be doing some focused listening today. The same thing happened to me with the Schubert 9/Bohm. It was the first S9 I ever owned and I was completely unaware of the repeats. After hearing them (I like mvt 1 repeat but mvt 3 is essential) a new world opened up and I began paying close attention to run times. Note: I may be in the minority here but the repeat in Beethoven 9/2 is not for me. It sounds like the record skipped and started over. The most underrated piece of music Schubert ever composed, in my humblest of opinions. The brilliant Rondeau Brillant. iirc Alfred Brendel was against the repeat in 960 because the first ending contains material that is too different from the overall character of the movement. Someone else (Rosen maybe?) argued that the difference makes it imperative to keep the repeat and compared omitting it to cutting off a limb. I suspect a lot of people leave out the repeats in Schubert because he writes movements that (with repeats) are very long, with recapitulations that follow the expositions note-for-note (so you basically hear the same material three times, just the third time in a different key), and they just get bored. Or think the audience will get bored, which is more or less the same thing. Or they're taking an inappropriately late-Romantic "endless melody" view of Schubert that severs him from his Classical tradition and makes the music sound rootless and vague. I think I once read that Brendel skipped the repeats so he could play the last 3 sonatas on one evening without making the recital unduly long. But this seems not a very good reason, so he might never have said that. If there is a long prima volta as in Schubert D 960 there is too much music skipped if the repeat is missing. If there is not and the movement is already rather long and repetitive (like the finale of the Great C major), it might work better without repeat. Schubert really is a special case, I believe, for the reasons mentioned. Another point is that for some of his movements (like the 1st in D 960 and 894) there is a tradition of playing them very slowly, so they become even longer. Apparently there are some listeners (and musicians) who seem to think that those overlong "meditative" pieces are exactly what Schubert wanted but I do have my doubts about that... Schubert could be, even in his last works in some respects surprisingly "formulaic"; the sometimes literal repetitions in the recap (something one will hardly ever find in Haydn), the clinging to the standard 4 movements with often apparently too slight or cheerful 3rd and 4th movements etc. *this also applies to double bar repeats of the "second part", i.e. development and recap in many works of Mozart and Haydn (and some early Beethoven and Schubert as well).
. Schubert could be, even in his last works in some respects surprisingly "formulaic"; the sometimes literal repetitions in the recap (something one will hardly ever find in Haydn), the clinging to the standard 4 movements with often apparently too slight or cheerful 3rd and 4th movements etc. The challenge is to makes sense of this. Saying that he just wrote bad music which we can improve be leaving bits out, that's always a possibility, it may be right. But I think it's best to keep it as a last resort, better to try to find a way to be more charitable I think. I'm not saying I've found the way, but I do think that resetting expectations away from Beethoven style vigorous movement to a goal is a start. Repetitions, even quasi literal ones, can be meaningful, in the context of music dealing with time, identity, memory, change, eternity. I don't think he wrote bad music and I explicitly said that one should not leave out a strange prima volta like in D 960,i because one thinks it does not fit with the rest of the movement. I trust Schubert far enough not to make "mistakes" like that. But I think that there might be cases of setting double bars for the customary repeats without thinking much about it or out of respect for tradition or whatever. So if there is no (or only a perfunctory bar or two) of music lost by skipping a double bar repeat I think there are often considerations in favor of skipping them so I do not automatically complain if an artist does that. I am not sufficiently familiar with Schuberts way of composing but it seems that he wrote incredibly fast without much sketching and would often just discard a whole movement or two because he "got stuck". The fragments around 1821/22 (c minor quartet movement, b minor Unfinished symphony, E major symphony sketch, and later the "Reliquie" D 840) seem to be indications of this. Through the end, Schubert basically uses only two options for a finale: a usually leisurely rondo-style, often with more or less obvious inclinations to dance/coffeehouse music and a very fast, often tarantella-like "dance of death". I think the 2nd type yielded very successful pieces and "closings", e.g. in the c minor sonata and the d minor and G major quartets. Also the C major symphony (but this is a little "too happy" and too long for my taste). Of the rondo-style I think by far the best and maybe the only one I consider great w/o qualifications is the one in the string quintet, although I also like the ones in the piano trios and the a minor quartet (partly because those works do not feel as serious in the first two movements as e.g. D 959 and 960). I do not dislike the scherzo/menuetto and final movments of D 894, 959 and 960 per se but the feel not really fitting after the preceding movements. I am not fond of the finale of D 850 because this just feels like an afternoon in the Kaffeehaus and tends to get too gemuetlich and repetitive (I am not too fond of the whole D 850, admittedly). Not quite that late but I rather like the finali of the a minor piano sonatas D 784 and 845. 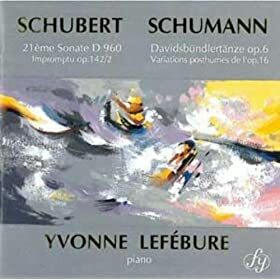 I always loved the vigor of the former but it took me a while to "get" the latter piece but I think now that it is one of the most impressive and original Schubert sonatas. 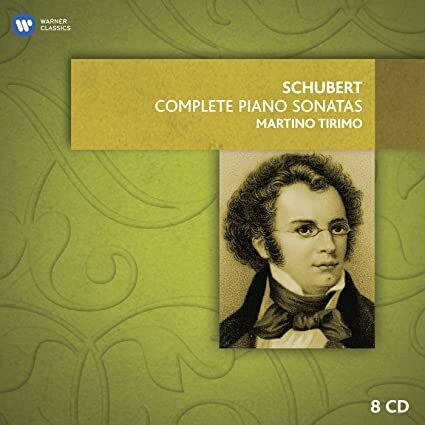 I decided to try another "complete" set of Schubert's piano sonatas, and from among the few remaining near-complete and complete sets I have yet to hear, I opted for Martino Tirimo's because, well, because it is cheap. And it's of the more complete than normal variety, spread out over eight discs and including incomplete sonatas, fragments, and the like. My only prior exposure to Tirimo was his Debussy, which is probably the softest edged Debussy I've heard. It's attractive but rather dull. His Schubert, it turns out, kind of is, too. There's not one bad performance in the lot. There are even a couple really good ones: D894 is probably the highlight of the set, lyrical and dramatic in proper measure, and D960 is comparatively intense. Throughout, everything is sensibly paced, dynamics and clarity are good, the music sings when it should, and so on. But with the two exceptions mentioned, and maybe a movement here or there, the playing rarely held my attention. It's another set where there's nothing exceptionable but nothing exceptional, either. Not really helping matters is sound: it sounds as though the set was recorded in an airplane hangar. After having heard a fair number of recordings by Steven Osborne, I have come to see his style as what I'll call museum quality piano playing. He never puts a wrong foot forward. Everything is meticulously played. His recordings have a sheen of perfection about them, and they practically yell, or at least politely proclaim, this is classical music. Yet something is held back. There's a reserve, a detachment to his playing. His style, for me, pays huge dividends in Ravel, and works quite well in Messiaen, too, but in Debussy, Mussorgsky, Prokofiev, Rachmaninoff, and Beethoven, there's a sense of things being a bit too smoothed over and constrained. The limitations are only evident if I opt to compare him to other pianists, and even then it is only the interpretation that I may have concerns about – if ''concerns'' they be. I didn't come to his Schubert with trepidation. I came to it with eagerness. My eagerness was rewarded. For the most part. The disc opens with D935, and all four impromptus sound unfailingly beautiful, though not lush and warm in the manner of Lifits, but rather polished, bright, and colorful. And the melodies are the thing here. Not to take anything away from Osborne's rock-solid left hand playing in terms of steadiness or clarity, but time and again on this disc, the right hand playing mesmerized me. His gentle dynamic gradations at the quieter end of the spectrum are glorious, and when the music should sing, it does. The great A flat major Impromptu, surely one of Schubert's greatest pieces, may (?) lack the intensity or deepest depths of some other versions, but it is so steady, so precise, and so controlled as to demand absolute focus from the listener. The melodies in the F minor Impromptu offer aural bliss. D946 starts off with a somewhat vigorously paced Allegro assai, which nonetheless remains lovely throughout. The Allegretto is lovelier yet, if perhaps lacking the otherworldliness of Kars or experiential depth of Paik. The Allegro is lyrical and the coda packs something of a punch. It is not dark, heavy, brooding ''late'' Schubert, but it is effective on its own terms. The disc ends with D576, Variations on a theme by Anselm Huttenbrenner, a piece I'm not even sure I've heard before (I'd have to check my collection). It is a most enjoyable piece, if not a grand set of variations. Listening, I sensed that museum quality feel to the playing throughout. It lacks that something special that, just sticking to this thread, Fray or Lifits brings. But that is observation more than criticism. This is an extremely fine disc, and one of Osborne's better outings. I certainly would not object if he recorded more Schubert. And I'd really like to hear him in person. After having heard a fair number of recordings by Steven Osborne, I have come too see his style as what I'll call museum quality piano playing. He never puts a wring foot forward. Everything is meticulously played. His recordings have a sheen of perfection about them, and they practically yell, or at least politely proclaim, this is classical music. Yet something is held back. There's a reserve, a detachment to his playing. His style, for me, pays huge dividends in Ravel, and works quite well in Messiaen, too, but in Debussy, Mussorgsky, Prokofiev, Rachmaninoff, and Beethoven, there's a sense of things being a bit too smoothed over and constrained. The limitations are only evident if I opt to compare him to other pianists, and even then it is only the interpretation that I may have concerns about – if ''concerns'' they be. I didn't come to his Schubert with trepidation. I came to it with eagerness. My eagerness was rewarded. For the most part. The disc opens with D935, and all four impromptus sound unfailingly beautiful, though not lush and warm in the manner of Lifits, but rather polished, bright, and colorful. And the melodies are the thing here. Not to take anything away from Osborne's rock-solid left hand playing in terms of steadiness or clarity, but time and again on this disc, the right hand playing mesmerized me. His gentle dynamic gradations at the quieter end of the spectrum are glorious, and when the music should sing, it does. The great A flat major Impromptu, surely one of Schubert's greatest pieces, may (?) lack the intensity or deepest depths of some other versions, but it is so steady, so precise, and so controlled as to demand absolute focus. The melodies in the F minor Impromptu offer aural bliss. D946 starts off with a somewhat vigorously paced Allegro assai, which nonetheless remains lovely throughout. The Allegretto is lovelier yet, if perhaps lacking the otherworldliness of Kars or experiential depth of Paik. The Allegro is lyrical and the coda packs something of a punch. 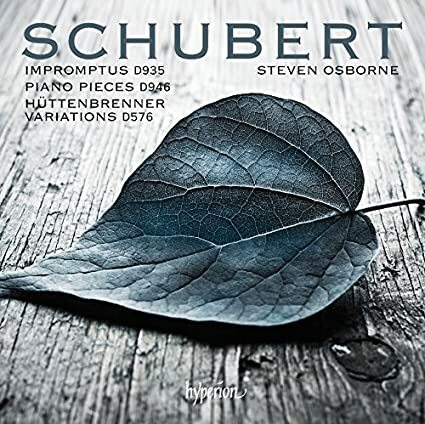 It is not dark, heavy, brooding ''late'' Schubert, but it is effective on its own terms. The disc ends with D576, Variations on a theme by Anselm Huttenbrenner, a piece I'm not even sure I've heard before (I'd have to check my collection). It is a most enjoyable piece, if not a grand set of variations. Thanks for sharing this. As a loyal Schubertian, this makes me want to explore (purchase) Osborne. I'll check Youtube now for versions. My exposure to Paul Lewis started with his LvB sonata cycle. I'm not much of a fan. Sure, he plays some sonatas splendidly, especially Op 106, but I find his approach too leisurely and polite overall. A few years ago, though, I attended a recital he gave that was right up my alley: Schubert's last three sonatas. Three big works. No frilly filler. And his playing was different than displayed in his Beethoven cycle. Quick, rhythmically vital, intense. Throw in unwavering seriousness and impressive command, and it was one heckuva a recital. CD 1 opens with D760. Lewis tears into the opening. It is fast and potent and if some of the chords strike me as not well defined, I think that's mostly the recording. This is much closer to the Lewis I heard in person than the Lewis I hear in LvB on disc. Lewis then slows way down for much of the Adagio, and other slow portions, but for the most part this Wanderer is tense, restless, energetic, possessed of rhythmic drive largely lacking in Lewis' Beethoven, and is just swell. D935 follows. Lewis keeps these mostly tense, too, or at least tenser than I usually hear. Partly as a result, Lewis' is not as lyrical as some other versions, but that's observation rather than criticism. Except for some individual rubato in the last of the four, everything sounds mostly straight-forward. The six disc journey starts well. The second disc keeps the journey moving along. Lewis plays the opening D845 with somewhat immoderate drive and intensity, but that's more than alright. While he largely backs off for much of the Andante, he also plays with bite where appropriate. The Scherzo and Rondo both display ample drive and intensity, bringing the piece to a satisfying conclusion. This is no dainty drawing room Schubert; this is closer to Gulda in mien. Good stuff. The Moments Musicaux follow, and they remain tense and a bit quick, don't sound especially lyrical, and don't plumb the depths. They do, however, evoke enough drama and flow superbly. The set ends with the D915 Allegretto, which sounds stylistically similar. The second disc of the set is also quite good. 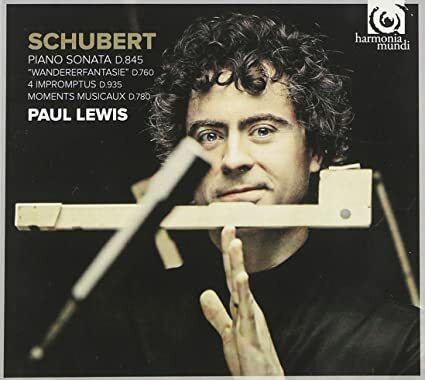 So, Lewis' Schubert is some serious stuff, not as beautiful and lyrical as some, but very satisfying in its more severe way. Thank goodness there are four more discs to hear. Pity that the sound is so distant and reverberant, which markedly impacts clarity. Elena Margolina is a pianist new to me. Ms Margolina studied in Russia and Germany, took first prize in the Fifth International Schubert Piano Competition in 1995, performs regularly around Europe, teaches in Germany, and has made a decent number of recordings of more or less core rep. That more or less sums up her not too lengthy bio, though I didn't do a lot of online investigation. But more important is her playing. The disc opens with D894. Margolina goes the slow route in the Molto moderato, taking nearly nineteen minutes. There are moments of beauty and lyricism, but there's also some tension, and her louder playing sometimes sounds hard, though never harsh. This is not mushy Schubert, nor is it over the top intense. The Andante maintains much the same feel and approach, to the music's benefit, as does the Menuetto. Margolina plays the Allegretto with subtle rhythmic snap and at times lovely lyricism, while never tipping over into syrupy or soft sound, rather maintaining a largely bright, clean, colorful sound, which she does most of the time. D946 comes relatively soon after Sokolov's new release, and there are some definite differences. Margolina does not display the almost inhuman dynamic gradations and precision evident in Sokolov's playing, though by no means does that mean that her playing is not controlled and accurate, because it is. Margolina shaves about a minute off the first two minutes off the first two movements, and two off the last when compared to Sokolov, and, accordingly, there is more energy and momentum and rhythmic snap. The slower passages don't sound as tonally lustrous, especially in the first piece, but Margolina's approach also sounds more integrated and focused on the whole rather than the parts. While very good overall, I find D894 more compelling on this disc, and find others more satisfying in this work – Paik, say, after programming the work to play in the correct order. SACD sound is excellent. I may have to give Margolina's other Schubert piano disc a shot. 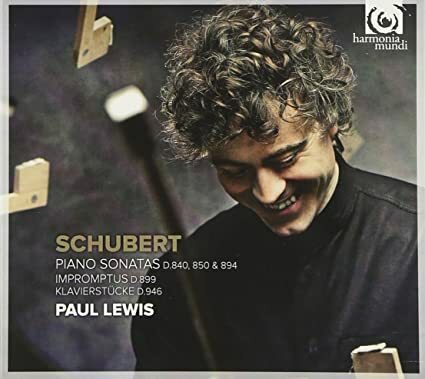 The second set of Lewis' Schubert starts off with D850. Lewis don't pussyfoot around in the opening Allegro. Fast, fast, fast, and incredibly well articulated, Lewis cranks right through the opener in high energy, virtuosic fashion. The slower passages seem close to unnecessarily slow, though they are lyrical and serve as nice rests before Lewis runs through the faster passages. The Con Moto maintains a faster than normal pace, some tension, some real intensity in some places, yet sounds songful. The Scherzo displays a perfectly judged mix of rhythmic verve, intensity, and lyricism, and it remains pretty much straight up serious. Lewis lightens up just a bit in most of the Rondo, letting some sections flow beautifully, and letting others sound fun, and letting yet others sound robust but not overdone. It's one heckuva a performance. Here's a rival for Leif Ove Andsnes. D894 follows. Not too slow at 17'28'', Lewis starts off with a well nigh perfectly judged dynamic range that allows him to build up volume and intensity effectively later on in the Molto moderato e cantabile. Lewis also plays with greater dynamic nuance on the quieter end of the spectrum, and plays most lyrically while keeping things tense. Lewis keeps things taut and comparatively swift in the Andante, while maintaining a more lovely than expected sound. The Menuetto adds some top-flight pianissimo playing to the mix, and the Allegretto balances the soft, lovely music and more vibrant playing well, and Lewis' vocalizing indicates he's into it. An extremely fine recording. The second disc starts off with the D899 Impromptus, and this is about the most serious take on these works I've heard. Lewis never plays an ugly note, and there are moments of lyrical beauty, but the tempi are generally on the swift side, the rubato minimized, the focus on forward movement. There is an intensity, a sort of grimacing medium-heartedness to the playing. If that reads negative, it's not meant to, it's just to say this is not mellifluous, light Impromptu playing. The proper two-movement D840 follows, and it sounds unsentimental, not to say cold, and satisfyingly large in scale. The exactitude of Lewis' playing, and his control, hint at why his Op 106 is so good. The disc closes with D946. Lewis strips out any hints of sentimentality and plays fast and just shy of relentlessly much of the time. The effect is most noticeable in the faster sections of the Allegretto. This is the antithesis of playing displayed by the likes of Sokolov or Kars. That written, Lewis does play the slower music of the movement with not a little beauty. Given Lewis' approach, the set is more or less in line with expectations. Good stuff. Pity about the too resonant sound. Neither Andsnes or Lewis float my boat in 850, they are inclined to be a bit too fast and furious, and I'm just not interested in that sort of thing. Of the two I probably prefer Lewis, partly because I like his tone. And because when he's fast, he's very very fast. The only 850 I really enjoy these days is Lilya Zilberstein's, on DG. Her approach is completely different, and for me it was a real revelation. My first sampling of the pianism of Matthias Kirschnereit. 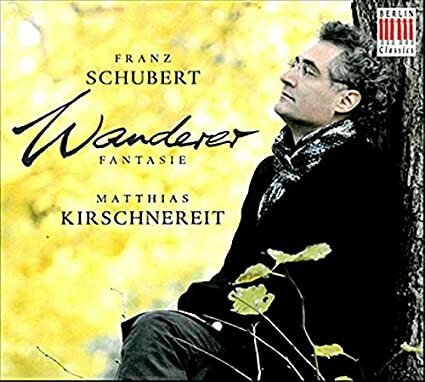 His Berlin Classics Schubert disc contains two big works – the D845 sonata and the Wanderer Fantasie – as well as five smaller works. The disc opens with the Hungarian Melody D817, and right out of the gate the distant sound and bright and occasionally flinty upper registers, combined with a springy legato-lite style, isn't nearly as much to my liking as Schiff or Fray. The D606 March and D593/1 Scherzo sound similar in style. Then comes D845. The Allegro is often kind of flat. It's not especially lyrical or beautiful, nor is it particularly aggressive, and the sound hampers the louder passages, which sound flinty in the right hand and a bit lacking in heft in the left. The Adagio also lacks lyricism, and only in the loudest passages is the intensity of note. The Scherzo and Rondo both sound stylistically similar to the first movement. The Andante D29 does end up sounding reasonably attractive, and makes way for a Wanderer Fantasie that is mostly about speed and at least a degree of intensity. Some phrases sound a bit clunky here and there, but it is OK+ in quality. The Allegretto D915 makes a nice enough ending to the disc. So, not so hot sound, sometimes flat playing, sometimes OK+ playing. Kirschnereit certainly can play the music, but his approach just doesn't work for me. Hello everybody, I'm new here and since I'm rediscovering Schubert I'd like to start with a simple question. Any opinions on the recent Schubert by Barenboim?